Discover the common approaches and qualities of those who, despite life’s adversities, are at peace in the world--and learn how you can be too. Ever wonder why some people seem to be at peace despite the ups and downs daily life can bring, while others are restless even in seemingly ideal circumstances?In Choosing a Good Life, Alyson Berman explores what it means to be at peace with ourselves, our choices, and the world around us in all its glorious chaos. She takes us into the lives of people who, despite their vastly different talents, challenges, and interests, have achieved a deep sense of balance in and satisfaction with their lives. Stories include those of Holocaust survivor Emery Jacoby, who rose above anger and bitterness to reaffirm the good in himself and others, along with Sungrai Sohn, a violin prodigy and gifted teacher who lives in the shadow of a potentially fatal illness and many other inspiring life stories. Berman then pinpoints their common approaches and qualities to reveal how they have found contentment-and how we can too.With Choosing a Good Life you will have the tools and guidance to:identify what you truly value,make use of the pain and trials of life to make you stronger, andset priorities to find more time and energy for the things that bring you satisfaction.Learn how to achieve something that eludes so many of us--the sense of purpose that comes with deep self-acceptance. Ali Bermanreceived her MFA in fiction from Sarah Lawrence College. She is represented by the Strachan Literary Agency. Her work can be seen in Unsaid Literary Journal, Elimae, Used Furniture Review and Puerto del Sol.In fall of 2014, Triangle Square Books for Young Readers, a division of Seven Stories Press, will publish her young adult novel Misdirected. The book follows a fifteen-year-old atheist boy from Massachusetts who immediately becomes an outsider after moving to a conservative Christian town in Colorado. 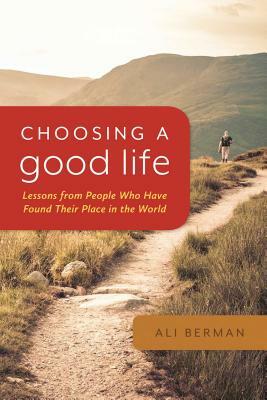 Also scheduled for fall 2014 is Choosing a Good Life from Hazelden Publishing, a book that explores people who are at peace with the world and what we can learn from them.In 2012 Ali co-founded flipmeover, a production company that uses media to raise awareness about important social issues. She co-wrote "quiet de luxe", their debut short film that has played in film fests around the world.When not devoting her time to her fiction, Ali works as a humane educator for HEART, teaching children about issues affecting people, animals and the environment. Berman resides in Portland, Oregon with her husband and two cats.